Trance in France Tracklist & Replay available! You can get the replay of this mix on the official Trance in France webpage! I’m pleased to introduce for episode #019 of Tic Tac Trance a new show feature! From now on, every couple of months, a person will present the past, current and future releases of the label the person is working for, this means a 1 hour exclusive showcase mix of this material! 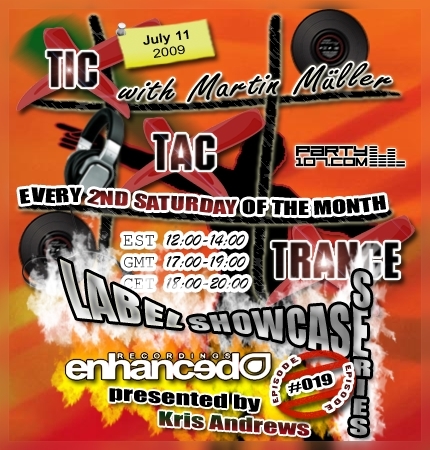 In this episode Kris Andrews will present one hour of trance in various of styles from Enhanced Recordings. My job for the first hour is to play you my current favorite tunes, so make sure you’ll tune in! If you’re interested to present your labels’ material, please send me an email. My show starts today at 18 CET / 17 GMT / 12 EST. Check out your local time HERE!